Keeping the file size of the built app to a minimum is often important, especially for mobile devices or for app stores that impose a size limit. The first step in reducing the size is to determine which assets contribute most to it, since these assets are the most likely candidates for optimisation. 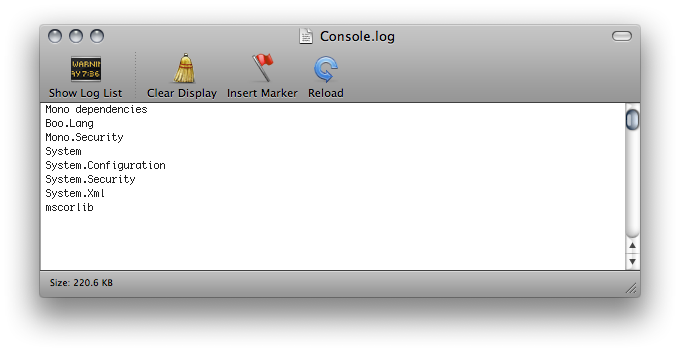 You can find this information out from the Editor Log just after you have performed the build (select Open Editor Log from the small panel menu in the top right of the Console window). The log provides a summary of assets broken down by type and then lists all the individual assets in order of size contribution. Typically, things like textures, music and videos will take up the most storage while scripts, levels and shaders are often negligible. Note that the File Headers mentioned in the summary are not assets in themselves. The headers are actually the extra data that is added to “raw” asset files to store references and settings. The headers normally make very little difference to asset size but if the value may be large if you have numerous large assets in the Resources folder. Unity re-codes imported assets into its own internal formats, so the choice of source asset type is not relevant. For example, if you have a multi-layer Photoshop texture in the project then it will be flattened and compressed before building. Exporting the texture as a PNG file will not make any difference to build size, so you should stick to the format that is most convenient for you during development. Unity strips most unused assets during the build, so you don’t gain anything by manually removing assets from the project. The only assets that are not removed are scripts (which are generally very small anyway) and assets in the Resources folder (since Unity can’t determine which of these will be needed and which won’t). With this in mind, you should make sure that the assets in the Resources folder are only the ones you really need for the game. You might be able to replace assets in Resources with AssetBundles to load assets dynamically and thereby reduce the player size. Often textures take up most space in the build. The first to do is to use compressed texture formats (DXT(Desktop platforms) or PVRTC) where you can. If that doesn’t get the size down, try to reduce the size of the textures. The trick here is that you don’t need to modify the actual source content. Simply select the texture in the Project view and set Max Size in Import Settings. It is a good idea to zoom in on an object that uses the texture, then adjust the Max Size until it starts looking worse in the Scene View. 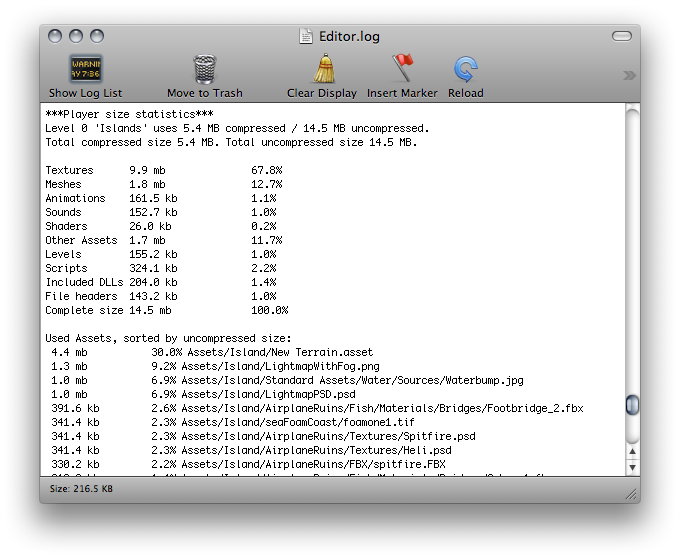 The formula for the total image storage size is width * height * bpp. If you are using mipmaps then the storage will be about a third larger than the single image. By default Unity compresses all textures when importing. For faster workflow in the editor, you can turn compression off from the Preferences but all textures will be compressed in the build regardless of this setting. Meshes and imported Animation Clips can be compressed so they take up less space in your game file. Compression can be turned on in the Mesh Import Settings. Mesh and Animation compression uses quantization, which means it takes less space but the compression can introduce some inaccuracies. Experiment with what level of compression is acceptable for your models. Note that mesh compression only produces smaller data files and does not use less memory at run time. Animation keyframe reduction produces smaller data files and uses less memory at run time and generally you should always have it enabled. When building a player, you should avoid any dependencies on System.dll or System.Xml.dll. Unity does not include these in the built player by default but if you use their classes then they will get included. These DLLs will add about a megabyte to the player’s storage size. If you need to parse XML in your game, you can use a library like Mono.Xml.zip as a smaller alternative to the system libraries. While most Generic containers are contained in mscorlib, Stack<> and few others are in System.dll, so you should avoid these if possible. Unity supports two .NET API compatibility levels for some mobile devices: .NET 2.0 and a subset of .NET 2.0. You can select the appropriate level for your build in the Player Settings. The .NET 2.0 API profile is similar to the full .NET 2.0 API. Most library routines are fully implemented and so this option offers the best compatibility with pre-existing .NET code. However, for many games, the full library is not needed and the superfluous code takes up valuable memory space. To avoid wasted memory, Unity also supports the .NET 2.0 Subset API profile. This is very similar to the Mono “monotouch” profile, so many limitations of the “monotouch” profile also apply to Unity’s .NET 2.0 Subset profile. (More information on the limitations of the “monotouch” profile can be found here). Many library routines that are not commonly needed in games are left out of this profile in order to save memory. However, this also means that code with dependencies on those routines will not work correctly. This option can be a useful optimization but you should check that existing code still works after it is applied.